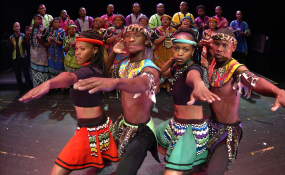 Soweto Gospel Choir (file photo). Cape Town — The Soweto Gospel Choir has been nominated for a 2019 Grammy Award. The group's nomination was announced on Friday in Los Angeles in the World Music Album category along with artists such as Bombino, Fatoumata Diawara, Seun Kuti and Egypt 80. See some of the other top nominees here. The South African music legends have already won two Grammys in 2008 and 2007 both in The Best Traditional World Music Album category. The award ceremony will take place on Sunday, 10 February.